OSHA may have strong principles about not issuing press releases that might embarrass companies that endanger or kill workers, but they’re gung-ho about press releases publicizing their cozy relationships with industry associations, especially where those relationships are actually helping those industry associations fight off regulatory activity in another state that would protect workers and consumers. Earlier this week, OSHA issued not one, but two press releases publicizing new Alliances that it had signed with the National Grain and Feed Association (NGFA), and the American Chemistry Council (ACC). In this case the Alliance with NGFA appears to be a pretty standard arrangement to develop more safety and health training materials for its members. But contrary to gullible headlines that state, “New OSHA Alliances Protect Workers From Grain Handling, Chemical Hazards,” the ACC Alliance appears to be a product designed not to protect workers, but rather to protect the chemical industry from California’s attempt to control worker and consumer exposure to the harmful effects of isocyanates. OSHA Alliances were created under the Bush administration to work more closely with “organizations committed to workplace safety and health to collaborate with OSHA to prevent injuries and illnesses in the workplace.” Their real purpose, however, was to make OSHA look like it was doing something while it was actually refusing to work on or issue any worker safety and health standards. It eventually took on a life of its own, reaching a new height of silliness when, in 2005, OSHA declared war on a little-noticed and non-existent health and safety crisis among dog groomers and formed an Alliance with the International Society of Canine Cosmetologists. OSHA Alliances were created under the Bush administration to make OSHA look like it was doing something while it was actually refusing to work on or issue any worker safety and health standards. At the beginning of the Obama administration, we debated whether or not to eliminate the Alliance program and finally decided to limit it only to those Alliances that had some kind of added value beyond the normal outreach that OSHA already did with its stakeholders. In other words, if the Alliance developed publications or trainings that OSHA or Alliance participants would not ordinarily do, an Alliance was proposed. Alliances that weren’t doing much were dropped. Some Alliance members, such as those in the Crane, Hoist and Monorail (CHM) Alliance, actually helped train OSHA inspectors on some of the more complex aspects of certain machinery and processes. An Alliance with the American Staffing Association resulted in several publications outlining the joint legal obligations of staffing agencies and host employers to protect workers. One other requirement that we put on the program: Wherever there was a potential Alliance addressed an industry sector that had significant union membership, the union also had to be part of the Alliance. Neither of the Alliances announced earlier this week have any union members, even though numerous union members in the chemical, auto and construction industry are exposed to isocyanates, and the United Food and Commercial Workers have a strong interest in grain handling. Better Understanding of Health Issues? Health effects of isocyanate exposure include irritation of skin and mucous membranes, chest tightness, and difficult breathing. Isocyanates include compounds classified as potential human carcinogens and known to cause cancer in animals. The main effects of hazardous exposures are occupational asthma and other lung problems, as well as irritation of the eyes, nose, throat, and skin. So will the “better understanding of the health issues” promoted by the Alliance include information about the carcinogenicity of these chemicals or the fact that the OSHA PELs are way too high? Color me skeptical. It’s also not clear that how the ACC Alliance can “share information on OSHA’s National Emphasis Programs” when is doesn’t appear that OSHA even has a current national emphasis program on isocyanates. A three year emphasis program was launched in June 2013. But the current webpage on the NEP says “This Directive no longer represents OSHA policy” and refers you to a PDF, which crosses out the three year period and replaces it with “To be Determined.” Nothing about isocyanates appears on OSHA’s Active National & Special Emphasis Program Index. So what is the real added value of this Alliance and who will benefit from it? Workers? Not so much. Is ACC or OSHA going to do anything with this alliance that they’re not already doing? Maybe a few on-line training resources and a fact sheet or two. Nothing they couldn’t have done without the Alliance. 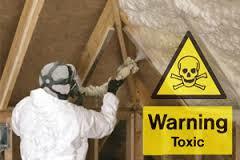 DTSC is taking this action to protect workers and consumers from exposure to unreacted methylene diphenyl diisocyanates that could occur during normal use of spray polyurethane foam systems. Inhalation and dermal exposure to unreacted MDI is associated with adverse health effects, including asthma and allergic sensitization. People who become sensitized to MDI may also experience life-threatening asthma attacks when subsequently exposed to extremely low levels of isocyanates. show how disease can devastate a worker’s life—many workers who developed respiratory disease after MDI exposure became unable to work at construction jobs. Isocyanate sensitization can occur from just one exposure, and there is no safe exposure level for sensitized individuals. In the reported cases, workers were often fired or forced to leave their jobs. This is consistent with the general findings on work-related asthma from the California Department of Public Health. hazards before they have a chance to affect people or their environments. That is what public health, and its occupational health and safety component in particular, are really about too. So how what does this have to do with OSHA’s new Alliance with the ACC? This Alliance is not so much about protecting workers or sharing information about non-existent regulatory activity or enforcement programs, but rather protecting an industry that is fighting new worker and consumer protections in California. Due to the extensive and meaningful work completed and ongoing in these cooperative relationships, we believe the regulatory scheme contemplated by DTSC will provide no meaningful or measurable increase in protection to workers or the public and might reduce the amount of resources available to continue in voluntary programs supported by federal agencies. Further, ACC is currently working with the OSHA Office of Outreach Services and Alliance on establishing a national alliance between OSHA and ACC to develop a collaborative relationship. At this time, the Alliance is being developed to provide additional training resources to protect the health and safety of workers, particularly by reducing and preventing exposures to diisocyanates and understanding the rights of workers and the responsibilities of employees under the Occupational Safety and Health Act – similar to OSHA alliances with other industries. These goals will be accomplished through continued effective training programs on health and safety procedures relative to diisocyanates regarding responsible practices, effective approaches and guidance through workshops, seminars and lectures. The Alliance is intended to include labor organizations as well. So, Alliance signed, regulation by California DTSC unnecessary, case closed. Right? In other words, what we have here is an Alliance that doesn’t appear so much about protecting workers or promoting an accurate picture of the hazards of isocyanates or sharing information about non-existent regulatory activity or enforcement programs, but rather protecting an industry that is fighting new worker and consumer protections in California, while at the same time making OSHA look like it’s actually doing something to help workers. We both know that this is the type of “stuff” that was to be expected. Moreover, it will likely get worse before it gets better.